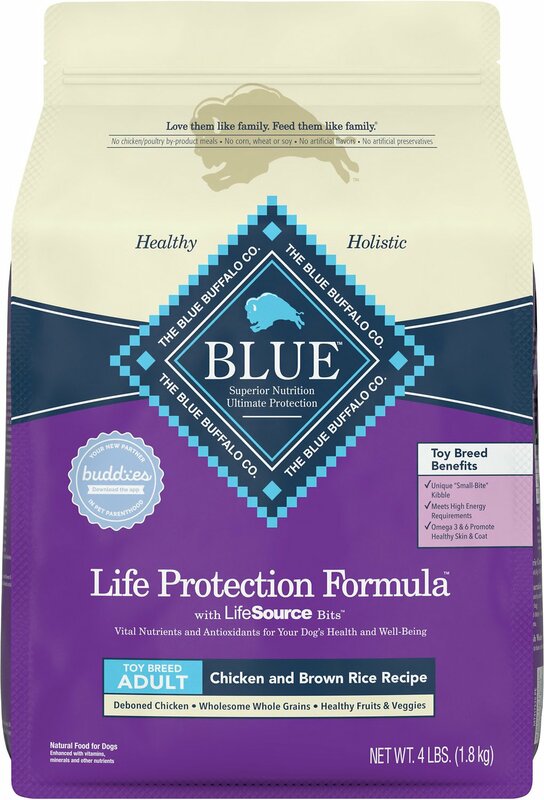 Blue Buffalo Life Protection Formula was created for the health and well-being of dogs. 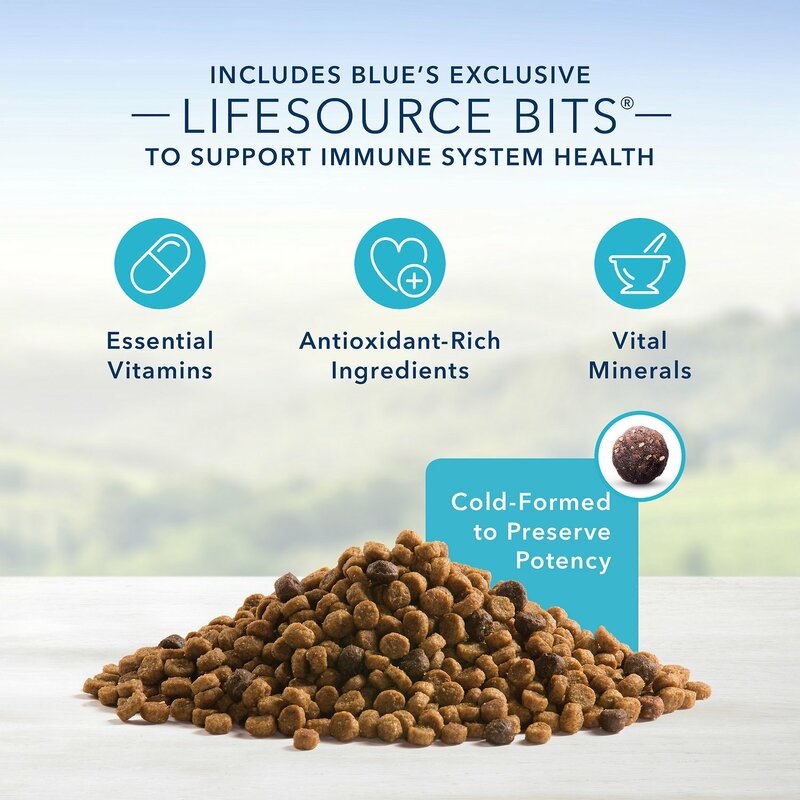 All formulas start with real meat, whole grains, garden veggies and fruit, plus added LifeSource Bits, a precise blend of nutrients that have been enhanced with a Super 7 package of antioxidant-rich ingredients. This Toy Breed Adult Chicken & Brown Recipe features delicious, protein-rich deboned chicken and is made with increased protein and carbohydrates to support the special needs of smaller dogs. Please note this item has recently undergone a packaging and slight formula change. Customers may receive the old packaging during this transition. Deboned Chicken, Chicken Meal, Brown Rice, Oatmeal, Barley, Flaxseed (Source of Omega 3 And 6 Fatty Acids), Pea Starch, Chicken Fat (Preserved with Mixed Tocopherols), Natural Flavor, Dried Egg Product, Dried Tomato Pomace, Peas, Pea Protein, Turkey Meal, Dicalcium Phosphate, Potassium Chloride, Dehydrated Alfalfa Meal, Salt, Dried Chicory Root, Potatoes, Pea Fiber, Alfalfa Nutrient Concentrate, Calcium Carbonate, Choline Chloride, Dl-Methionine, Preserved with Mixed Tocopherols, Sweet Potatoes, Carrots, Garlic, Zinc Amino Acid Chelate, Zinc Sulfate, Vegetable Juice For Color, Ferrous Sulfate, Vitamin E Supplement, Iron Amino Acid Chelate, Blueberries, Cranberries, Barley Grass, Parsley, Turmeric, Dried Kelp, Yucca Schidigera Extract, Glucosamine Hydrochloride, Niacin (Vitamin B3), Calcium Pantothenate (Vitamin B5), L-Carnitine, Copper Sulfate, Biotin (Vitamin B7), L-Ascorbyl-2-Polyphosphate (Source of Vitamin C), L-Lysine,, Vitamin A Supplement, Copper Amino Acid Chelate, Manganese Sulfate, Taurine, Manganese Amino Acid Chelate, Thiamine Mononitrate (Vitamin B1), Riboflavin (Vitamin B2), Vitamin D3 Supplement, Vitamin B12 Supplement, Pyridoxine Hydrochloride (Vitamin B6), Calcium Iodate, Dried Yeast, Dried Enterococcus Faecium Fermentation Product, Dried Lactobacillus Acidophilus Fermentation Product, Dried Aspergillus Niger Fermentation Extract, Dried Trichoderma Longibrachiatum Fermentation Extract, Dried Bacillus Subtilis Fermentation Extract, Folic Acid (Vitamin B9), Sodium Selenite, Oil of Rosemary. BLUE Life Protection Formula always features high-quality real meat, healthy fruits and wholesome whole grains. 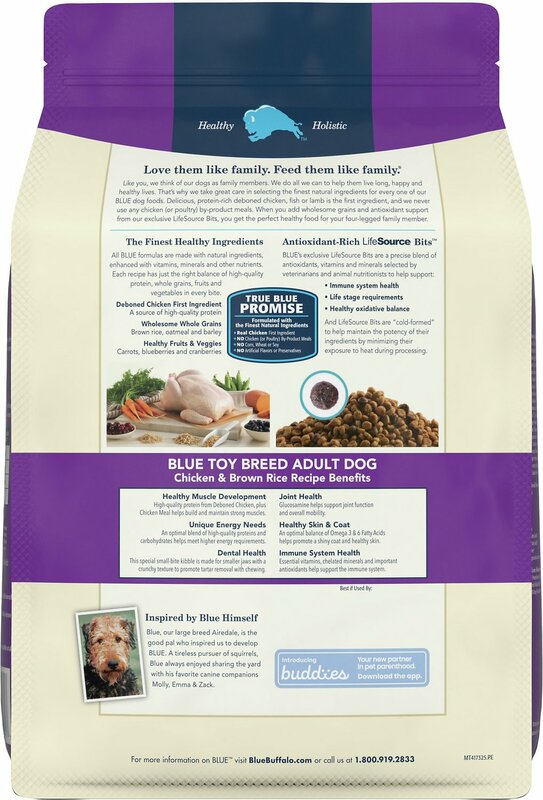 Like all BLUE foods, it's made from the finest natural ingredients enhanced with vitamins and minerals. APPLES: Good source of antioxidants, vitamin A, vitamin C and dietary fiber, which promotes overall gastrointestinal health. SPINACH: Rich in carotenoids, including beta-carotene and lutein, and also contains quercetin, a phytochemical with antioxidant properties. PUMPKIN: Rich in beta-carotene, vitamin A, iron, potassium, magnesium and zinc, plus a good source of fiber to help regulate digestion. Healthy Muscle Development: High-quality protein plus protein meal and egg help promote strong muscles. Small breed formulas are precisely blended to help meet small and toy breeds' higher energy needs. Large breed formulas feature L-carnitine to help promote lean muscle mass. Strong Bones AND Teeth: Calcium, phosphorus and essential vitamins help promote strong bones and teeth. 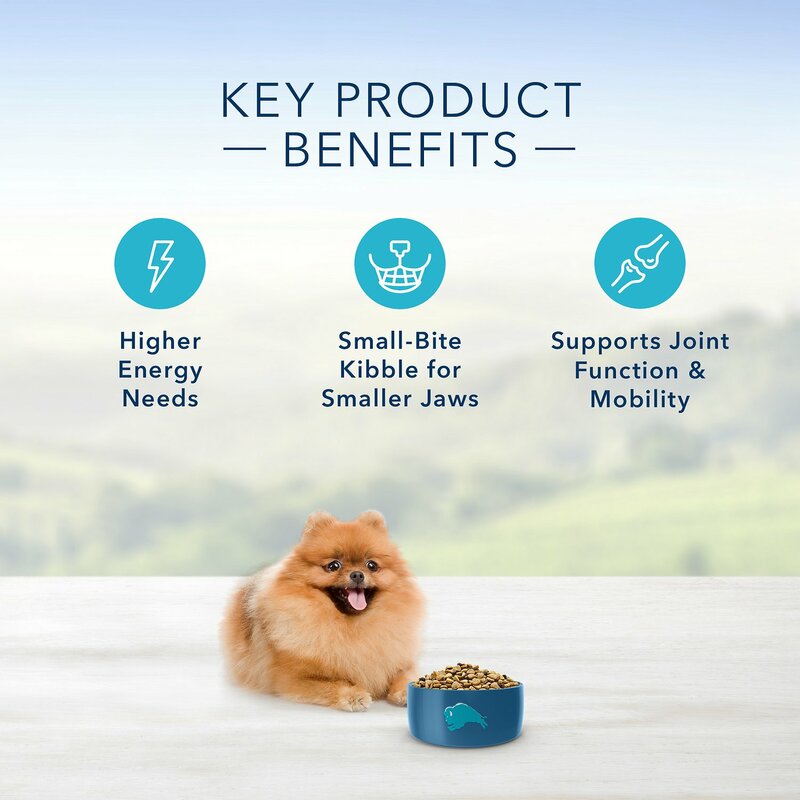 Small breed formulas feature special "small-bite" kibble for easier chewing and tartar removal. Large breed formulas contain glucosamine and chondroitin to support joint function and mobility. Healthy Skin, Coat and Immune System: Omega-3 and 6 fatty acids help promote a shiny coat and healthy skin. Essential vitamins, chelated minerals and important antioxidants help support the immune system. Gave my toy poodle the runs! I can't speak for others who have used this dog food, but it made my 1 year old toy poodle have the runs! Both inside our house and outside, so he is no longer eating this food. Ever since we went back to the regular blue buffalo for small breeds he has been back to normal. Like I said, can't speak for how it may affect your dog but it didn't sit well with mine. 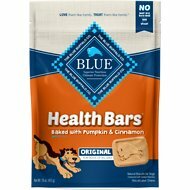 Like I mentioned above, the food content is great but my dog did not like it, I really wished he would have loved it but he would not eat it at all. I’m sorry but I’m being honest. I have 2 Chihuahuas, Csinos is 10 years old and Charley is my rescue girl, she is 7 years old. It was hard finding a food that they both were able to eat and like. Charley is only 4lbs, however, Csinos is my boy and is overweight weighing 9lbs. He did lose 1.5lbs since having this food in his diet. I am so thankful to have found this food for them both and they both love it. We have been trying different foods to see which one the boys like. This is one that they seem to like well. I have a Zuchon and this helps with allergies and overall stomach well being, and I’ve tried quite a few brands. Fabulous! Nice being able to eliminate that stop having to go and pick up puppy food.